If The Grove's walls could talk, you'd be hard-pressed to shut them up. Dating back to the 1790s, this charming country house on the North Norfolk coast has a history as rich and varied as the county itself. From its origins as a home to 18th-century Quakers to a wartime base for army officers en route to the battlefields of Europe, The Grove has seen it all. But its current incarnarnation as a guesthouse dates back to 1935, when Norfolk natives Robert and Hilda Graveling rented the house and its seven lovely acres. Nothwithstanding the inevitable interruption of the war years, The Grove has been welcoming guests ever since. 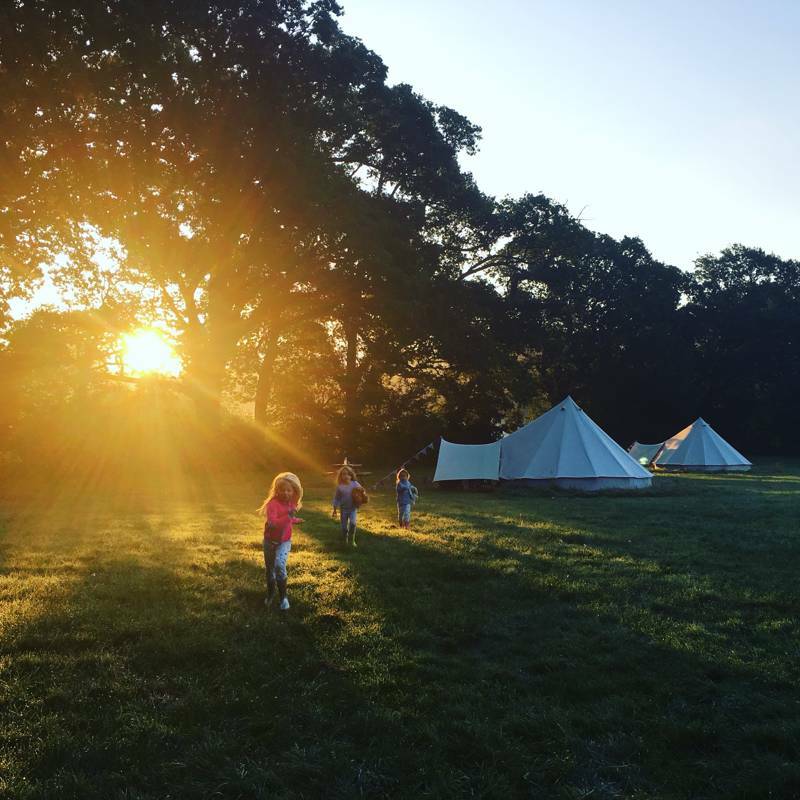 And now with three generations of the Graveling family having helmed the hotel, The Grove's next chapter as one of the English east coast's most sought after glamping experiences has just begun. 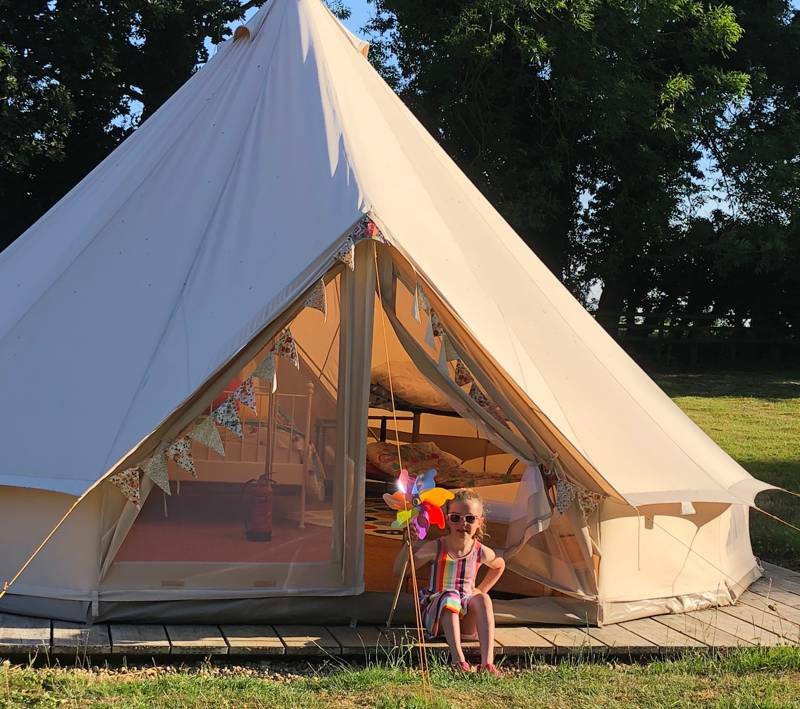 Starting life as a regular summer pop-up for exclusive hire, The Grove Glamping has proved such a success that it seemed darn-right silly not to share this unspoilt spot with the legions of other coast-bound-campers. 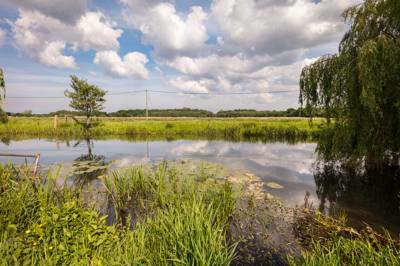 The established site now sits within a tranquil clearing just a toddle from the main guesthouse. Comprising five comfortably-furnished yurts, proper beds and bedding and warming wood-burning stoves are the order of the day here. Congenial keeper-of-the-camp Ruth Graveling has implemented lots of helpful touches to ensure a hassle-free holiday – bespoke food hampers (BBQ? Breakfast? The choice is yours), firepits with kitchen tripod; hammocks; each yurt even boasts low wattage 240-volt electricity courtesy of solar panels, so you can charge your phone to keep radio-contact with reality (though why you'd want to in a setting as scenic as this is beyond us). Away from your canvas commune, the sophisticated surroundings of The Grove guesthouse are free for glampers to enjoy. The heated indoor swimming pool is perfect for a rainy-day dip if the conditions at the nearby beach prove too treacherous, while The Grove's award-winning restaurant is an institution in its own right. Showcasing the best of Norfolk's plentitude of produce, it's clear to see the AA's two rosette's were well-earned. Much of the magnificent dishes are sourced straight from The Grove's salubrious garden, orchard and poly-tunnels – a legacy of the wartime call to 'Dig for Victory'. While the restaurant's gorgeous oak-panelled Georgian dining rooms are perfect for a refined evening meal, they make for an equally relaxed setting for a leisurely morning's breakfast. 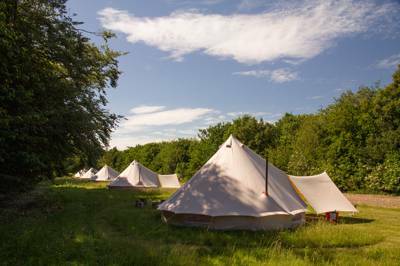 Suitably sated, glampers can then get down to the pressing business of exploring the best the Norfolk coast has to offer. With a private path linking the grounds through the enchanting Warren Woods to the dramatic cliff top at Cromer, guests are never far from that authentic Norfolk experience. 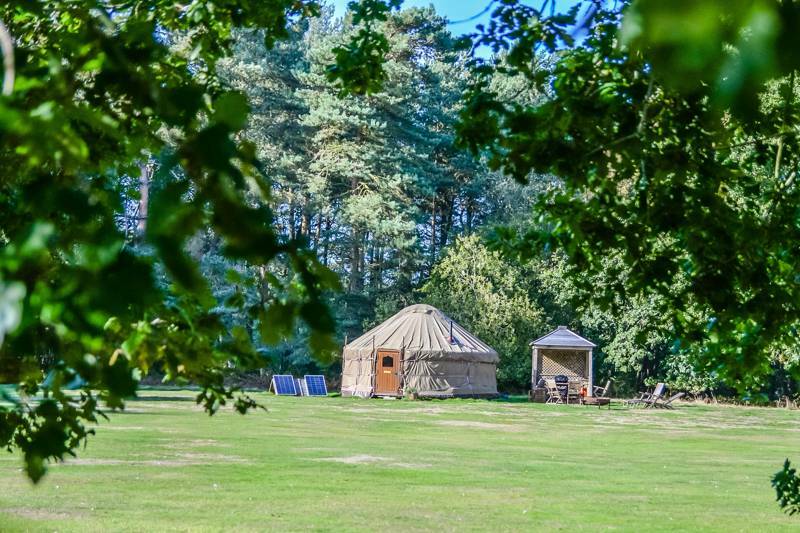 Come and enjoy a beautiful stay by the coast in one of our 5 yurts. They all have wood burning stoves and 15 tog duvets and proper mattresses, as well as bunk beds with 4-season sleeping bags, to keep you warm. The two Mongolian Yurts have an oak door and an insulated canvas walls which surround the wooden lattice walls and ceiling. Your stay includes access to the swimming pool and all The Grove facilities. We are 5 minutes walk from the beach! All you have to bring with you is towels, torches, washing up things, and charcoal if you want a BBQ. Everything else is provided. You will receive a basket of wood on arrival and after that there is a small charge for wood. There is a minimum 2 night stay. 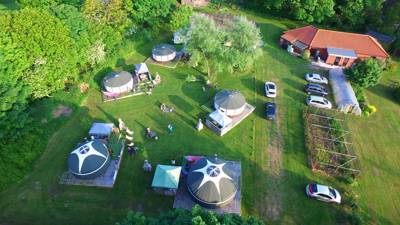 5 yurts (3 sleeping 4 people, 1 sleeping 6 people and 1 sleeping 8). Facilities include 2 toilets and 3 showers. Each yurt has its own wood-burning stove as well as solar panels for charging small electrical items. Double bed, bunk bed and sofa-beds all have proper mattresses. There is a heated indoor swimming pool, table tennis table, and children's play area with treehouse and trampoline. Parking is permitted right near the tents. Wi-Fi in the hotel but not in the glamping field. Bike hire available. BBQs and firepits provided. The delights of the North Norfolk Coast are easily explorable from The Grove. Cromer, with its charming early 20th century pier (01263 512281) is the nearerst town. But a short drive along the shoreline in either direction leads to any of the county's innumerable seaside spots including Blakeney, Cley and Wells-next-the-Sea. The latter boasts a lovely sandy stretch of beach, but the dunes and pine trees at nearby Holkham Bay offer a less commercial day out. If hitting the waves is high on your agenda, Glide Surf School (07966 392227) offer hire and lessons for all levels. The Grove can also arrange discounts. History buffs should make for Walsingham Abbey & Gardens (01328 820510) to marvel at the mammoth medieval ruins, or Sheringham's brand-spanking new museum The Mo (01263 824482) for the daring rescues of the local lifeboat fleet. Further afield, you'll find the cobbled streets of Norwich – why not leave the car at camp and takes the steam locomotive down the Bittern Line (01603 224248). The Grove's very own AA 2 Rosette restaurant offers delicious seasonal dishes made using the finest Norfolk produce. You can't get much more locally-sourced than the fruit and veg from The Grove's very own garden, orchard and poly-tunnels. Its oak-panelled study and the original Georgian dining room are equally wonderful settings for a leisurely breakfast or refined evening meal. Hampers for glampers are also available. The county is famous for its seafood, so for all you a-fish-ionados, the wonderful Cley Smokehouse (01263 740282) derserves a visit for its traditionally smoked kippers, haddock, prawns, crevettes, salmon and the classic Norfolk bloater. Visiting in May? Join the Cromer & Sherringham Crab & Lobster Festival for a sample of the county's most famous shellfish delicacy. From Cromer: Head towards Overstrand on the Overstrand Road. The Grove is located on the left just after two miniroundabouts. From Norwich: Head towards Cromer, turn right at the first mini roundabout to go down Cromwell Road. Turn right on the next mini roundabout and left on the adjoining one to be on Overstrand Road. The Grove is about 100m on the left hand side. The excellent Coasthopper bus service runs from the Cromer all the way to Kings Lynn. Cromer railway station is about 15 mins walk from The Grove. This provides links to Norwich and Sheringham. There is a bus that regular bus service to goes to and from Norwich bus station, with the bus stop just a few minutes from the site.